Click here for the Binary Puzzle Solver. 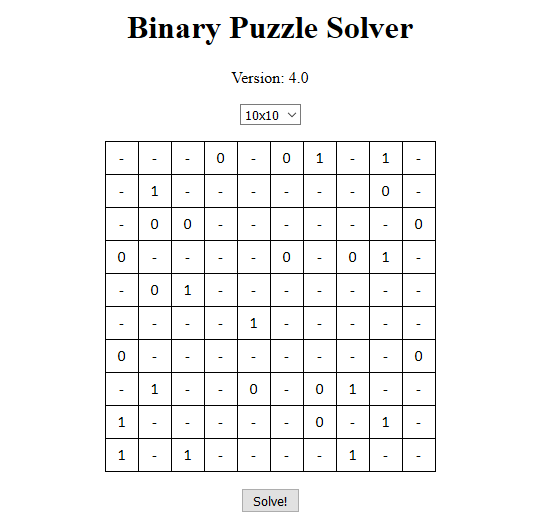 The Binary Puzzle Solver is also available as a web service. It would be nice when a printcommand could be build in. the output (solving sequence) is printed in the console. It would be nice if we could copy text from the output tab. However, thanks for this nice and useful app ! Your binary puzzle solver is a very handy tool.It is the only one of it's type I was able to find online which is not some kind of app.However on the following puzzle from http://www.binarypuzzle.com it gave me the wrong answer. which is virtually identical to the starting puzzle except I have "guessed"
I guess there's some small bug in the program.I don't even think that it's really necessary to try to correct it.I just wanted to bring it to your attention. I am resubmitting my previous post since I had used dashes as blank fields for the binary puzzle and it did not appear properly.I will now substitute "x". 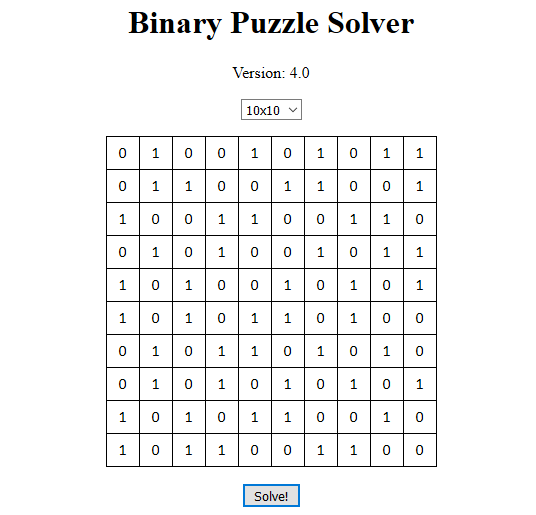 Your binary puzzle solver is a very handy tool.It is the only one of it’s type I was able to find online which is not some kind of app.However on the following puzzle from http://www.binarypuzzle.com it gave me the wrong answer. I guess there’s some small bug in the program.I don’t even think that it’s really necessary to try to correct it.I just wanted to bring it to your attention. It seems that I didn't update the web-application to my newer 2.2 version. The online solver will do fine now. Thanks again for your feedback! now there is one duplicate pair of columns instead of the two in the original solution.Now columns 4 and 8 are illegal duplicates.Sorry to make a big fuss about this.I just find it interesting. which is wrong because row 4 has triple 1's and rows 5 and 7 are illegal duplicates.So STRANGE things are happening. Java is browser-independent so the program's execution can not be affected by the browser. This would mean my program generates different "solutions" for one same puzzle. Indeed, I was able to reconstruct your findings in Eclipse: sometimes my solver gave me the right solution, other times it gave me the wrong solution. There is definitely a bug in my program. I will clear this out and come with an updated version. There was a bug in the validation of the puzzle in the function "guess and validate". I updated the solver to version 2.3. Please try it and let me know if it works for you. I ran a few puzzles through your updated solver and it appears to be working properly.I commend your for being willing to put in extra time and effort without financial remuneration so that your solver would work properly.You obviously take a lot of pride in your work.Thank you so much. They have 6x6,8x8,10x10,12x12 and 14x14 puzzles of four levels:easy,medium,hard and very hard.Your updated solver seems to come up with the correct solution for different sized grids and different levels. They offer only 9x9 puzzles of three different levels:easy,medium and hard.I have had mixed results on their puzzles.On the easy and medium puzzles,your solver seems to work.On the hard puzzles,especially the first few,your solver encountered several different problems:on the very first one(and possibly others too)it just froze and wouldn't come up with a solution. On other ones,it would come up with an erroneous solution where one or more of the starting values I had entered had changed to it's opposite value.It also produced wrong solutions where it violated the duplicate row or column rule. But,on some of the hard puzzles,it did come up with the correct solution. I am sorry to bother you again.I just don't know why it encountered these problems.If you have a chance,visit the second site and see if you encounter the same problems.Thank you for your patience. You are right. The solver has troubles with the hard puzzles. If I may ask, why are you so interested in solving all these puzzles? It's just something I have become fascinated with lately.I have been a sudoku fan for years.It actually doesn't make much difference if your solver doesn't solve the 9x9 ones correctly since that site shows you the solutions if you wish.The other site doesn't. A major update was necessary to overcome all the problems with those 9x9 puzzles. More details can be found in my post at http://www.magmeister.be/?p=227. Thank you for having the patience,willingness and determination to again update and improve your solver.Those 9x9 hard puzzles are wicked compared to the ones on the other site.I can only begin to imagine the effort involved.I hope you experienced a great feeling of satisfaction when you finally succeeded.That is the feeling I would get when I successfully completed writing a program in the past.I used to write programs in real old school computer languages(Cobol,Fortran,Basic and Qbasic come to mind).You have to have a certain kind of dedication to do it. Your new solver appears to be working perfectly.I hope it will be of use to other Binary puzzle fans besides myself.If you ever visit Las Vegas,Nevada(my home for almost 30 years),I would like you to contact me so that I can take you to dinner as a small token of gratitude for the work you have put into this project.Keep up the good work. I wish you a lot of fun solving puzzles! I just tested your solver on 18 of the 9x9 hard puzzles and it correctly solved ALL of them.It appears to be working perfectly due to your patience and persistence.Your dinner in Las Vegas is still waiting.I hope that the longer it takes for you to get here,the more of an appetite you will have !!! Could you describe what you do for each screen shot? Example: find pairs. I think I know this one. Eliminate Set Combinations - Rank 0. (don't have a clue). How do you denote when the program has performed a guess? Thanks. For example: in a row or column with rank 0, all zeros (or ones) are determined. This means that al other remaining values must be ones (or zeros). In fact a rank 0 is just completing the row or column. A guess and validate will be printed in the console. Remember that guess and validate will only be used for more difficult puzzles. Lovely solver, I was stuck on a 8x8 Very Hard level and your program solved it perfectly. Being interested in where I got stuck, I looked at the output, trying to figure out what my next move would've been, but it said "Solve Level 1, Binary Puzzle Solver" inbetween and it put down a 1 and a 0 which made no sense to me whatsoever. Was it just guessing at this point and see if it was the right solution? Or am I missing some kind of obvious move? When I started playing these puzzles I was told you can always deduct the solution with logic, and wouldn't ever need to guess, was that wrong? The solving level is indeed an indication that a guess was made. After the guess the puzzle will be solved further with logic. Nevertheless there is only 1 solution: if you guessed wrong and you would continue solving the puzzle with logic, it will turn out that the solution is invalid. At this point my solver is implemented to resume at the point where the guess was made, and will take a new guess.